Over time, when a metallic glass is put under stress, its atoms will shift, slide and ultimately form bands that leave the material more prone to breaking. Rice University scientists have developed new computational methods based on a general theory of glasses to explain why. 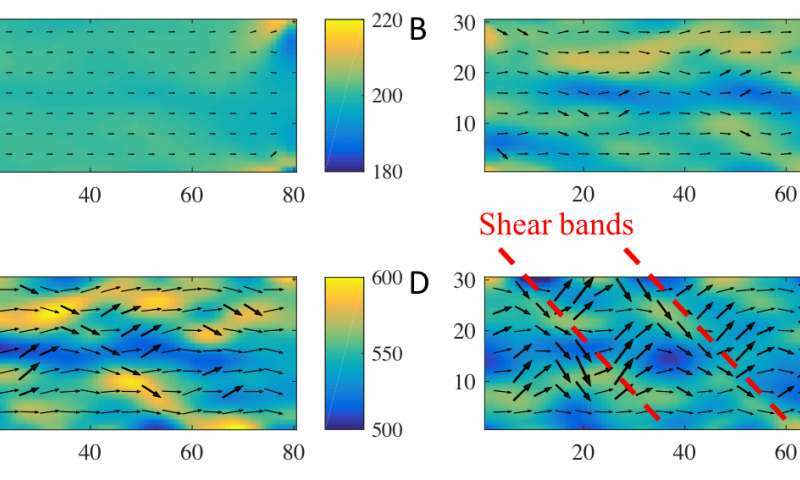 A new paper in the Proceedings of the National Academy of Sciences by Rice physicist Peter Wolynes and former graduate student Apiwat Wisitsorasak lays a foundation to calculate how all types of glass morph over time when they are put under mechanical stress. Their formulas could help scientists and manufacturers make glass better for specific applications. Metallic glasses are alloys that have a glass-like disordered structure rather than the polycrystalline structures of familiar metals. They can be both brittle and ductile to degrees and can be made into complex shapes, like the heads of golf clubs. Unlike window glass, they are conductive and may be useful for electronics. Outwardly, glass may seem solid, but the random array of molecules inside is always moving, Wolynes said. It has been known for decades that when stressed, glasses will form shear bands, lines that localize the strain. Many ideas have been put forward about how this happens, but now the Rice group can explain the phenomenon using a general theory of how glasses form based on energy landscapes. Wolynes has continued his long-running study of the molecular properties of glass at Rice's Center for Theoretical Biological Physics (CTBP), where he also develops the physics of energy landscapes for protein and DNA folding. His motivation for the new work was to see if the formation of shear bands could be explained through computations that describe how stress changes the rate of atomic rearrangement in the glass. "My immediate interest is to show that this phenomenon of the shear bands, which is a noticeable thing in metallic materials, can be understood as part of the unified theory of glasses," he said. That theory, formed over decades by Wolynes and colleagues, describes many aspects of how glasses form when a liquid is cooled. He said two factors prompt the formation of shear bands in metallic glasses. "One is that when glass is formed, it's a little weaker in some places than others. In that respect, the bands are partly programmed into the glass. "The other factor is the element of randomness," he said. "All chemical reactions require concentrating energy in some particular mode of motion, but motion in glass is especially complex, so you have to wait around for an activating event to happen by chance. You need a sort of nucleation event." These seemingly random "activation events," molecular couplings that happen naturally as a supercooled liquid flows, become rare when the glass settles into its shape but ramp up when the glass is stressed. The events trigger the cooperative movement of adjacent molecules and eventually result in shear bands. The bands, the researchers wrote, mark regions of high mobility and where local crystallization can occur and show where the glass could ultimately fail. Wolynes said the random first-order transition theory allows scientists to "say things about the statistics of these events, how big they are and the regions involved, without having to simulate a complete event using molecular dynamics simulation. "This opens up the ability to do realistic calculations on the strength of glass and, certainly, metallic glasses. One could add the features of crystallization and fractures to the model as well, which would be of interest to materials scientists working on practical applications," he said. Wolynes and Wisitsorasak tested their ideas on a two-dimensional computer model of Vitreloy 1, a metallic glass developed at the California Institute of Technology that "freezes" at its glass transition temperature of 661 degrees Fahrenheit. The researchers placed the model under strain, collapsed the months required for a practical study into seconds and watched the material form shear bands precisely as seen by labs and in line with established theory, Wolynes said. Computer models are the way to go for such studies, he said, because lab experiments can take months or years to bear fruit. "Our work sets the stage for a new way to model the mechanical properties of glassy materials that flow, as well as this weird phenomenon where the effect you see is macroscopic, but it's actually being caused by events on the nanoscale," he said. "Theory lends transparency to how glass breaks" Pun definitely intended.